Have you seen websites that add an smooth scroll to top of page effect? This is great when you have a long page, and you want to give your users an easy way to get back to the top. 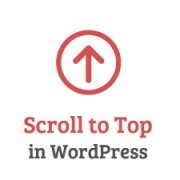 Recently one of our readers asked us about adding a smooth scroll to top effect in WordPress. In this article, we will show you how to add a smooth scroll to top effect in WordPress using jQuery. Note: This tutorial is created for a DIY intermediate user who is comfortable editing their themes. If you want to use a plugin method, then please use smooth page scroll to top plugin. For those who want to learn how to do this without a plugin, then please continue on reading. What is Smooth Scroll and When to use it? It just sends users to the top of the page and scrolls up the entire page in milliseconds. It is functional, but kind of like a bump on the road. Smooth scroll is opposite of that. It smoothly slides user back to the top of page. This creates a nice effect and improves the user experience. Save the file and upload it to your WordPress theme directory’s /js/ folder (see How to use FTP to upload files to WordPress). If your theme does not have a /js/ directory, then create one and upload smoothscroll.js to it. This code is the jQuery script that will add smooth scroll effect to a button that takes users to the top of the page. Next thing you need to do is to add the smoothscroll.js to your theme. To do that nicely, we will enqueue the script in WordPress (learn more in our guide on how to properly add scripts in WordPress). Copy and paste this code to your theme’s functions.php file. In the above code, we have told WordPress to load our script and also load jQuery library since our plugin depends on it. Now that we have added the jQuery part, lets add an actual link to our WordPress site that takes users back to the top. Paste this HTML any where in your theme’s footer.php file. As you noticed that we have added a link but have not linked it to any text. That’s because we will be using an image icon with upward arrow to display a back to top button. In this example we are using a 40x40px icon. Add this to your theme’s stylesheet. In the CSS above, we have used fixed position for our image icon and used an image icon as the background image. You can upload your image icon using WordPress media uploader and then get the image url to paste it as background url. We have also added a little CSS animation to the button which rotates the button when a user takes their mouse over it. Scroll to top effect allows users to go back to the top and find other things to do on your website. Another thing you can do is add a floating footer bar like we have on our site to display featured content. If you don’t want your users to scroll to top to share your article, then we highly recommend that you use the floating social share bar plugin like we have on WPBeginner. We hope this article helped you add a smooth scroll to the top of page effect on your site using jQuery. To see some other cool uses of jQuery in WordPress you can look at our jQuery FAQ accordion article or the lazy loading images article. Do you think that scroll to top effect are useful? Let us know by leaving a comment below. Thank you very much! This is very clearly explained. Helpful. The Jquery method didn’t work for me using a Twenty-seventeen child theme. Oh well. The hyperlink version did work perfectly, thankfully, and it’s good enough for me. One question…could one reason why this is not working for me (the jquery method) be because my WordPress installation is in a subfolder? It’s the only reason I can think of. Would love this, but it break the footer.php. The footer simply does not load. When i try ad it to footer.php i get “There is a syntax error on line 14. etc etc”, and when i try upload it anyway, the footer does not load. thanks a lot, simple and effective. my two cents, if you allready have a custom.js file in your theme you can simply add the jquery function in this file instead of creating a new file and enqueue again. Personnally i prefer to have all my small scripts in one file. What am I doing wrong ? This is my funtions.php new to wp_enqueue_scripts. Twenty Fifteen-Child Theme made a Js folder added all the wp_enqueue_script but no dice not sure what went wrong. I want to use less plugins as possible they seem to slow WordPress sites down. Added A favicon perfect wp_enqueue_script kind of new to me. Any help? Can anyone see what the problem might be? Is there any way to make this fade out before it gets to the bottom of the page? Hi, its working fine. Thank you for the tutorial but i only have just one problem, the image appears to quick. can i do something to appear later / a little bit down, after scrolling? This is a very clean way to pull this off. By far my favorite I’ve found. Quick question… I have put it in my footer.php file… How can I get it to stop sticking at a certain point? For example, I have a footer that is 575px tall and I don’t want the icon going into that area. Basically stop the fixed position at say, 600px from the bottom of the page. Would this solution add the smoothscroll.js file to the portion of the html file or…? If I understand you correctly you want to add it to the main menu nav? Correct? Simply use the same selector name but change the css completely. So that the image won’t appear. Thanks à lot for this tip ! However I’ve got a problem. When I reduce the size of the screen, my arrow go away while I want it in a specific place. Thank you man! works like magic.. you really made my day! Thanks for this! It works great. Question: Is that closed bracket correct after -webkit-transform: rotate(360deg)? I set this up on my site, but I don’t see the icon! How can I find out why it’s not working? There could be any possible reasons. First make sure you have uploaded the image, then check that the background: url has the correct URL and that it leads to your image. Lastly check that jquery and your .js file is loaded. Lastly, try tweaking CSS values for display, position, and text-indent. I figured it out – I had to change the 40px height and width to conform with my image.